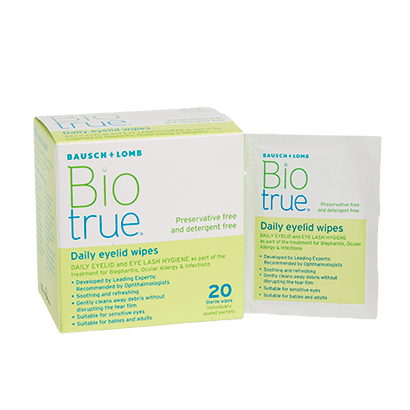 Enjoy total hygiene with Biotrue Daily Eyelid Wipes, designed to keep your eyelids clean and eyes feeling fresh. Whether you wear contact lenses or not, you can get rid of all dirt and debris in the areas around your eyes, and make sure nothing gets in the way of your vision, with Biotrue Daily Eyelid Wipes. Developed by eye care experts Bausch & Lomb, the wipes are individually wrapped to guarantee optimum sterility. The chances of infection or irritation are minimised when you use Biotrue Daily Eyelid Wipes, preservative-free wipes that not only eliminate bacteria but offer a soothing and refreshing sensation. The wipes are ideal for everyday morning use, but can be used whenever the need arises, to ensure your eyes stay clean and undisturbed. These wipes are suitable to help treat Blepharitis, Ocular Allergy and infections. If you have any questions, please don’t hesitate to contact us, our dedicated customer service team will be happy to help at FeelGoodContacts.com.